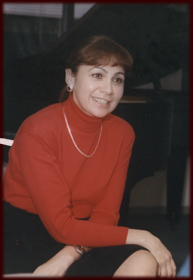 Piano Studio "Rich in Art"
Mrs. Gorin founded the Gorin School of Music (GSM), where she taught from 1991-2013. Prior to establishing the GSM, she taught piano at the Community School of Music and Arts, Mountain View, California (1987-1991); Agora Hill Music Conservatory, Agora Hill, California (1983-1987); Junior Music Academy, Thousand Oaks, California (1981-1984); Private piano studio, Thousand Oaks, California (1981-1987); and Music-Pedagogical College, Kiev, Ukraine 1973-1978. Mrs. Gorin also served as accompanist for Ballet Classes in collaboration with ballet dancers from Kiev Ballet Theatre, Ukraine (1968-1977). Currently, Mrs. Gorin is teaching at her piano studio in Incline Village, NV. Prize winners for number of years at the US Open Music International Competition, Oakland, California; Prize winners at the Junior Bach Festivals, Berkeley, California; Prizes winners (more than a dozen, age 5-18) at the "Sound of Music Festivals", Palo Alto, California, and many other local competitions. Numerous Mrs. Groin's students have passed the California Certificate of Merit Program, levels Prime to Advanced, and were chosen to perform at the annual Music Teacher's Association Conventions and participate in the Master Class programs at the Conventions. Mrs. Gorin's students also participated in the National Guild Piano Auditions with a high score of achievements throughout years of study. Member of the Music Teachers' Association California, MTAC (1979-Present); member of the Music Teacher's National Association, MTNA (1987-Present); Board-member and President of Palo Alto Branch of MTAC (1987-1995); Board-member and Vice-president of MTAC (1995-2002); MTAC Program Convention Chair (1999); Young Artist Solo/Ensembles Competition Chair, MTNA (CAPMT); Faculty member of American College of Musicians, Austin, Texas (1987-Present); Evaluator for Certificate of Merit Exams, MTAC (1990-Present); Adjudicator for National Guild of Piano Auditions (1990-Present); Adjudicator for United States Open Music Competition, Oakland, California (1995-1997); Adjudicator for Reno, NV Music Festival (2010, 2011, 2012, and 2013). Rufina Goring received her B.A. from Kiev Music College in Piano Performance and Piano Pedagogy in 1968 and M.A. from Conservatory Pedagogical division, Kiev/Nezin, Ukraine in Piano Performance and Choral Conducting in 1976. She has studied under Dr. Samuel Gindin, Dr. Alexandra Ostrovskay, Dr. Lydia Sure, Kiev, Ukraine who has being students and followers of the leading pedagogy methods of T. Leschetizky, A. Schnabel, and G. Neigauz. Gorin's interest and passion was to open the world of music to her students, to give them skills and abilities to create a beautiful sound (colorful tones), flawless technique, and ability to interpret composer's intent; in other words, to give them tools and interpretive understanding. Continuing her own education, Mrs. Gorin has attended many seminars and training sessions from leading specialists in the field of music education, including Frances Clark, Richard Chronister, David Krohenbule, Laurette Goldberg, Dorothy Taubman, Robert Page, Seymour Bernstein, Angela Hewitt, John O'Conor, and others. She maintains close ties to the music life of Moscow State Conservatory by attending its masterclasses, concerts and Tchaikovsky competitions since 1978-present.